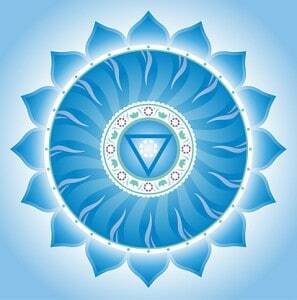 The Throat Chakra is the chakra of communication, self expression and judgment. Also known as the Vishuddha, this Chakra rules your self expression, and the ability to speak one’s truth. As a result, it influences self expression through writing, poetry, and public speaking. In addition, the Vishuddha influences your faith, and will power. In contrast, the need to criticize, a lack of authority, and indecisiveness reflect an imbalance of the Throat Chakra. Information stored in the Vishuddha Chakra includes personal truth and self knowledge, and your attitudes. In conclusion, a Throat Chakra imbalance may be experienced as poor self expression, habitual lying, doubt, fear, and uncertainty. Where is the Throat Chakra & What is the Color? The Vishuddha Chakra is located in the throat, and it’s color is turquoise or aqua, with the secondary color as various shades of light blue. The Vishuddha is connected to the Fifth layer of the aura, the Etheric Template. This layer of the aura is a “template” for your physical body in the astral plane. For example, when a person experiences “astral projection”, and walk around in an invisible form of their physical body. Crickets and other singing insects are the natural sound associated with the Vishudda. Also, the human vowel sound “Eye” and the mantra tone “Ham”, and the musical keynote G. The sound frequencies 141.27 Hz, 384 Hz, and the Solfeggio tone 741 Hz are also beneficial to the Vishuddha. A crystalline Solfeggio tone of 741 Hz is perhaps the most efficient way to quickly open and cleanse the Throat Chakra. The Solfeggio tone of 741 Hz is believed to awaken the intuition. Take 27 minutes with a pair of headphones and our Alpha Level Binaural Beats to freely speak your Truth. 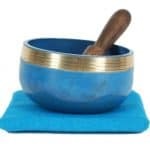 This Chakra balancing MP3 uses Tibetan Singing Bowls attuned to the Vishudda, and the Binaural Beats use a Solfeggio frequency of 741 Hz. The binaural beats progress along Earth Resonant frequencies, to a low of 7.83 Hz (the Shumann Resonance), and ramps back up to an Earth Resonance of 14.1 Hz. This deeply relaxing sound therapy meditation will not only help balance your Throat Chakra, it will also balance your spirit to the frequencies of the planet Earth. The Throat Chakra Binaural Beat MP3 and 8 minute MP4 video, with PayPal for Desktop. Chakra Gemstones such as turquoise, fluorite, blue opal, blue topaz, or blue lace agate aid in Vishuddha balance. 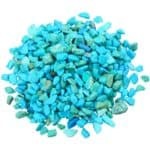 A pretty turquoise necklace might be just the thing to open up your Throat Chakra, and your channels of communication! 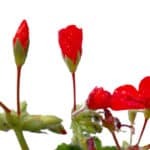 Chakra essential oils used to balance the Throat Chakra are sage, lemongrass, cosmos, larch, blue chamomile, trumpet vine, geranium and hyssop. Foods to fuel the Vishuddha are liquids; water, fruit juice, and herb teas. Also, tart fruit such as lemon, lime, grapefruit, or kiwi, and tree grown fruits such as apples, pears, peaches, apricots, and plums. Simple spices like salt and lemon grass help express the Throat Chakra. Yoga poses such as Fish pose, or “Matsyasana”, open and clear the Throat Chakra, and keep you flexible and relaxed. If you like this Throat Chakra video, you can download it as an Android and Amazon app. My name is Dr. Jane Ma’ati Smith C.Hyp. Msc.D. I studied for my Bachelor of Arts degree at Arizona State University. Also, I went on to receive an honorary doctorate for my lifetime achievements and contributions in metaphysics and spiritual counseling from Universal Life. I studied hypnosis with Dr. John Kappas, and am a certified graduate of the Hypnosis Motivation Institute. Finally, I am also a Sound Energy Practitioner and a Vibrational Reiki Master. 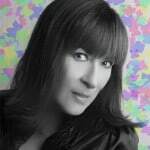 I bring to my Chakra healing, sound therapy, binaural beat programs more than 15 years of professional work in the mental health and counseling fields. With more than fifteen years of success in the helping professions, I can express this lifelong conviction with confidence. Placing people firmly on their personal path is my passion- are you willing to take the first step?